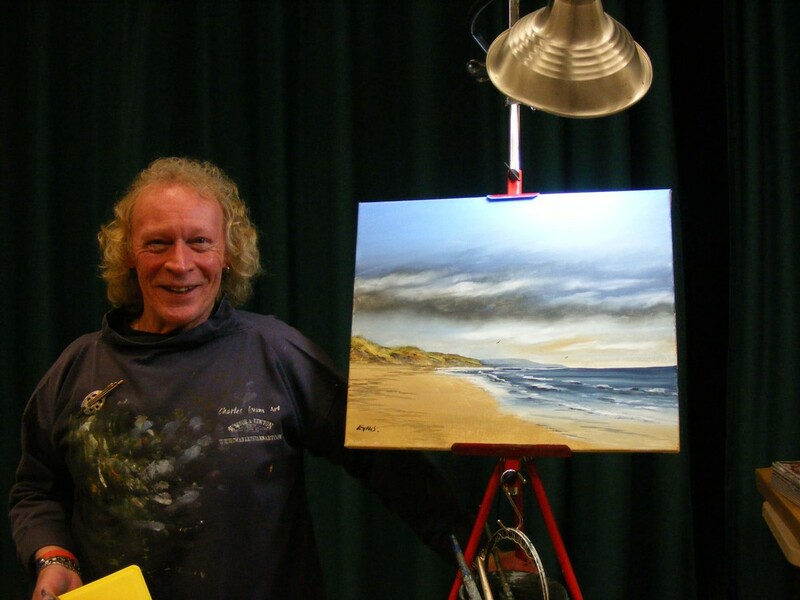 In March we had the pleasure of a visit from Charles Evans, a popular artist, demonstrator and TV personality. He travels the country demonstrating and doing workshops using Windsor and Newton products, of which he says there are 150 colours in their range and he uses only 8! Charles produced two watercolours, one before the break and one after, with a running commentary with many tips and wrinkles along the way. The first scene could have been in the Northumbrian hills, taking a pencil he drew a simple scene with hills and valleys. Then with a big brush and loads of water he wet the sky area, again with his large brush swept colours into it, he then squeezed out the brush and began to take out colour to form the clouds, moving it from one place to another, it was very effective. Sky done. Now on to the hills, building colours, mixing on the palette and dropping them into the picture and leaving a blank line right across the middle. Filling in the foreground with the lighter colours, building them up as well – they all dry 50% lighter.. Finally the blank line in the middle, lots of different darker shades were sploshed into it, and then whilst still wet, Charles produced a piece of plastic, not unlike a credit card and began scraping across the tops of the dry stone wall and forming the bricks within it – amazing effect! He then started darkening the foreground under the wall and to the front of the picture, telling us to mix a black never use a premixed one as it makes the picture flat, the final touch was scraping upwards with his finger nails to create grasses within the wall which was also an interesting and effective technique. Charles second painting was at the seaside, again building the sky first, then the coastal hills and sea areas, again using his credit card to scrape out the rocks on the beach and the headland, a few darker spots to emphasise the grasses coming over the headland and the picture was almost done. He then showed us how to place people in the picture, he said we must remember a letter ‘P’ and ‘Y’, ‘P’ forming the body with a head on top, and ‘Y’ forming the legs. It was a very entertaining evening, much banter and a lot of hints and tips along the way, most people seemed to enjoy it. Charles donated the paintings to the club, thank you Charles looking forward to seeing you again. Thank you again to Charles Bezzina for coming along and doing a fantastic demonstration and talk. Charles paints in some of the remotest corners of the world including the Arctic, it was truly fascinating listening to you tales and painting techniques.